Well, I’ve only gone and done it! Much to my huge astonishment I found on Monday night that I’d won the Best Food Blogger in the Food Awards 2016. Bowled over is an understatement, I was so convinced I wouldn’t win that it didn’t properly register when Tin and Thyme was announced as the winner. 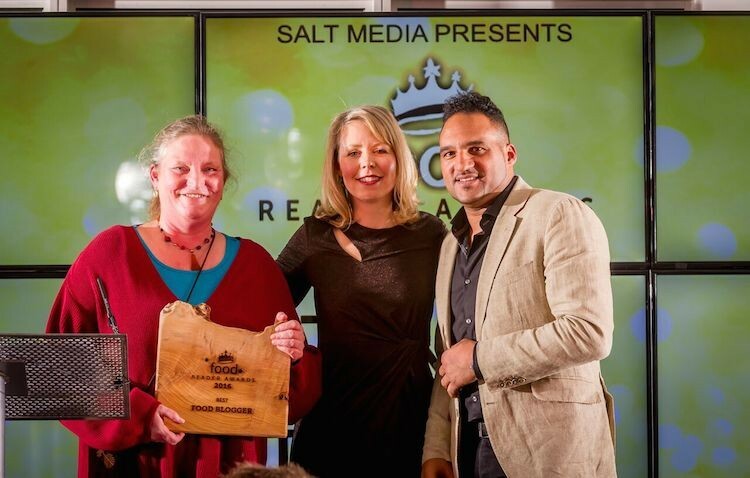 For those not in the know, the Food Reader Awards were initiated by Salt Media and its widely read Food magazine five years ago in order to celebrate good food. Winning is a prestigious accolade for food people in the South West, comprising Gloucester, Bristol, Somerset, Dorset, Devon and of course Cornwall. There are thirteen categories in total, including best food blog. The Food Awards occasion itself is an event I’ve long wanted to attend and this year I got my chance. I wasn’t aware, initially, that I’d been nominated for the award. It wasn’t until Tin and Thyme got through to the Food Awards shortlist that this fact impinged itself on my consciousness. A second round of voting took me through to the finals and I was invited up to Yeo Valley HQ for an evening of fine dining, people watching and the grand unveilings. We started proceedings with a glass (or two) of Knighton Cornish sparkling wine and fabulous canapés from Bioaqua and Homewood. We then sat down to a four course meal, using local produce, matched with local beers and ciders. I was rather taken with the Frobishers Sparkling Ginger, which was nice and fiery and meant I didn’t indulge in more alcohol than was good for me. With well over a hundred guests, there were only seven vegetarians present, but the Yeo Valley chefs did us proud. No sooner had we finished our starters than the Best Food Blogger 2016 was announced. Tin and Thyme was a finalist along with Veggie Desserts and Eating Exeter. I had been theorising to CT that our table which was the furthest from the stage couldn’t possibly have any winners. How wrong I was. Off I stumbled up the aisles to the stage, in a complete daze. I remember shaking hands with Jo Rees and Michael Caines MBE, who presented me with my rather fabulous wooden plaque / chopping board. Rest assured no knife will ever be drawn across its surface. I’ve no idea what I said, but CT assures me I didn’t make a complete fool of myself. Michael Caines was himself a winner that night. Needless to say, I didn’t get to reciprocate by presenting him with his chopping board for Best Food Hero. One can but dream. Cornwall gave a very good account of itself on the night (hooray!) and won best: Food Cafe, Cookery School, Wine List, Farm Shop, Restaurant, Hotel, Foodie Pub and weirdly, food blogger. For the complete list of winners and grand finalists head to the Food Awards. Yahoo! Well done. Looks like a fantastic night, live the chopping board trophy! Well done Nicette – and well deserved of course! Thank you so much Shaheen. that’s such a lovely thing to write and I know it’s heartfelt too. Was even more convinced I’d not be the winner when I found I was sitting so far away from the action. Congratulations, an award well deserved! Well done and huge congratulations! The award itself looks so stunning; love the chunky board. Thank you Agata, the board is something a bit different and I love it too. Thank you very much Gill. Everyone is being very kind. Thanks Sophia, it’s all very exciting. Many congratulations, rest assured that they would not have awarded it to you if you had not deserved it. You should feel very proud of yourself. Gosh thank you Julie. I’m not really used to bragging, but I really am excited to have received this. Well done Choclette ! Everybody loves you and your blog. Keep up the good work and best wishes for the future. Thank you very much Henk. I must say it was rather a surprise, but a very nice one. What amazing news – congratulations on winning and well deserved! Thanks Lucy, it’s fab news indeed. To say I was surprised was an understatement! Congrats! I love your email which aways signals a sneaky break! Haha, I’m very glad to be of service 😉 And thanks very much for your good wishes. WOW congratulations. You must be thrilled!! What a great award….and an inspiration to us all!! Thank you Gloria, that’s very kind. I am truly thrilled and humbled too. Hurray for tea and teapots. We’re raising a cup with you. Thank you, If it wasn’t for the photo, I’d reckon I’d dreamt the whole thing. Wow I haven’t heard of this but congrats! That’s a great achievement. Thanks Johanna. It’s so good a vegetarian blog won. As I said in the post their were only seven vegetarians at the meal, so if it helps to raise the profile, so much the better. Haha Lesley, now that’s where CT comes into his own 😉 Thank you, I still can’t quite believe it really happened. Thank you Camilla, it’s really just what I needed and I’m still buzzing now. Great job! Your smile says it all!! Ah, thank you Elaine, how lovely of you to comment. I am only treading in the footsteps of your gorgeous daughter. Thanks Becca, I really didn’t believe it was going to happen. Well done! This is wonderful news! Keep at it, dearie! Thank you so much Belinda, apart from being immensely pleased for myself and Cornwall, it was really nice to have a vegetarian blog win. I’m so happy for you, well done, totally well deserved 🙂 And I’m delighted to see that Kate was on the shortlist, too — it makes me think I should probably try out the third one who I hadn’t heard of! Congrtulations Choclette! Very well deserved. The food you ate looked delicious as well. Is that a rhubarb baked Alaska?? Thanks Andrea. The Alaska was fabulous, but filled with honey ice-cream. The rhubarb (poached in ginger) was just on the outside. Not before time, or should that be thyme? So pleased that your wonderful blog has got the recognition it deserves. Thyme of course Janice. Thank you so much and for all your support too. Thank you so much Elizabeth. To say I was utterly surprised is an understatement, but I was. of course, also delighted. Very well deserved Choclette, so pleased for you! And it sounds like the awards evening was lots of fun too… stunning food! It was all rather wonderful Kate. The best blog category was announced just after the starter, so I was able to revel in the rest of the evening. Excellent news – well done. The time I’ve spent in the South West in the last few years has been blessed with superb food and so this is a very fine award to win. Richly deserved, of course. Thanks very much Phil, much appreciated. Food down here has come on tremendously in the last decade or so. Hearty congratulations! A great honour and absolutely well-deserved, fantastic! Thank you very much Katharine, that’s kind of you. Congratulations!!!!! So proud of you, Choclette. Well done and what a brilliant start to 2016! Where are you going to keep your award? Hehe. Thanks Sarah, great start indeed. I still have no idea where I’m going to keep it!!! Well done on your wonderful achievement, well deserved! What a lovely reminder you have there too in that lovely chopping board. Aghhhh, 36 yrs? How does that happen? What a lovely surprise to hear from you. What are you up to these days and in what part of the country? Well done- very well deserved! So pleased for you – always good to see a fellow blogger do well. Ah, thanks very much Lesley, that’s kind. It was a much needed boost. How wonderful! Huge well done and congratulations! Hey, thanks Kavey. It was a night to remember. Congratulations! I’m a bit late to this party, but all the same — well done! I just put up a post about blogging, and I hope you’ll read it and comment about your thoughts on the subject. I mean, since you ARE an award winning blogger and all! AND I LOVE that cutting board! Thanks Jean, the best people are often late to parties 😉 I shall head on over now.